This name uses Spanish naming customs: the first or paternal family name is Rodríguez and the second or maternal family name is Ibarra. This name uses Spanish naming customs: the first or paternal family name is Díaz and the second or maternal family name is Pacheco. Juan Carlos Rodríguez Ibarra (Mérida, Spain 19 January 1948) is a Spanish politician of the Spanish Socialist Workers' Party (PSOE). He was President of the Assembly of Extremadura for 24 years (1983–2007). He gained a degree in philosophy from the University of Seville. In 1977 he was elected to the Spanish Congress of Deputies representing Badajoz region serving until 1983 when he resigned to become President of the autonomous community of Extremadura. 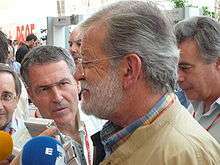 He has also been deputy of the Assembly for Badajoz, General Secretary of PSOE of Extremadura, Executive Secretary of the Executive Federal Commission of the PSOE and teacher in commission of services for political matters of the Department of Hispanic Philology of the University of Extremadura in the Department of Education of Badajoz. The University of Córdoba in Argentina granted him an honorary doctorate on 16 September 2003. He is married to Leonor Godoy and has a daughter. At the end of his term of office he was very criticised because of his support to the Balboa oil-refinery, property of his close friend Alfonso Gallardo, one of the most known businessman in the region.